..... Our first care must be that the sheep should be gathered to the great Shepherd; there will be time enough afterwards to secure them for our various folds. To make proselytes, is a suitable labour for Pharisees: to beget men unto God, is the honourable aim of ministers of Christ." WHAT IS IT TO WIN A SOUL? This may be instructively answered by describing what it is not. We do not regard it to be soul-winning to steal members out of churches already established, and train them to utter our peculiar Shibboleth: we aim rather at bringing souls to Christ than at making converts to our synagogue. There are sheep-stealers abroad, concerning whom I will say nothing except that they are not “brethren”, or, at least, they do not act in a brotherly fashion. To their own Master they must stand or fall. We count it utter meanness to build up our own house with the ruins of our neighbours’ mansions; we infinitely prefer to quarry for ourselves. I hope we all sympathize in the largehearted spirit of Dr. Chalmers, who, when it was said that such and such an effort would not be beneficial to the special interests of the Free Church of Scotland, although it might promote the general religion of the land, said, “What is the Free Church compared with the Christian good of the people of Scotland?” What, indeed, is any church, or what are all the churches put together, as mere organizations, if they stand in conflict with the moral and spiritual advantage of the nation, or if they impede the kingdom of Christ? It is because God blesses men through the churches that we desire to see them prosper, and not merely for the sake of the churches themselves. There is such a thing as selfishness in our eagerness for the aggrandisement of our own party; and from this evil spirit may grace deliver us! The increase of the kingdom is more to be desired than the growth of a clan. 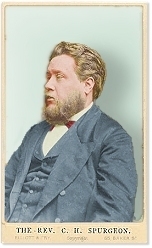 We would do a great deal to make a Paedobaptist brother into a Baptist, for we value our Lord’s ordinances; we would labour earnestly to raise a believer in salvation by free-will into a believer in salvation by grace, for we long to see all religious teaching built upon the solid rock of truth, and not upon the sand of imagination; but, at the same time, our grand object is not the revision of opinions, but the regeneration of natures. We would bring men to Christ and not to our own peculiar views of Christianity. Our first care must be that the sheep should be gathered to the great Shepherd; there will be time enough afterwards to secure them for our various folds. To make proselytes, is a suitable labour for Pharisees: to beget men unto God, is the honourable aim of ministers of Christ. C.H. Spurgeon, The Soul Winner, p. 11-12, Pilgrim Publications, 2007. Newer PostWhy Christians should do more than others?